(Like Quaoar, Orcus is one of the largest known EKOs -- more). 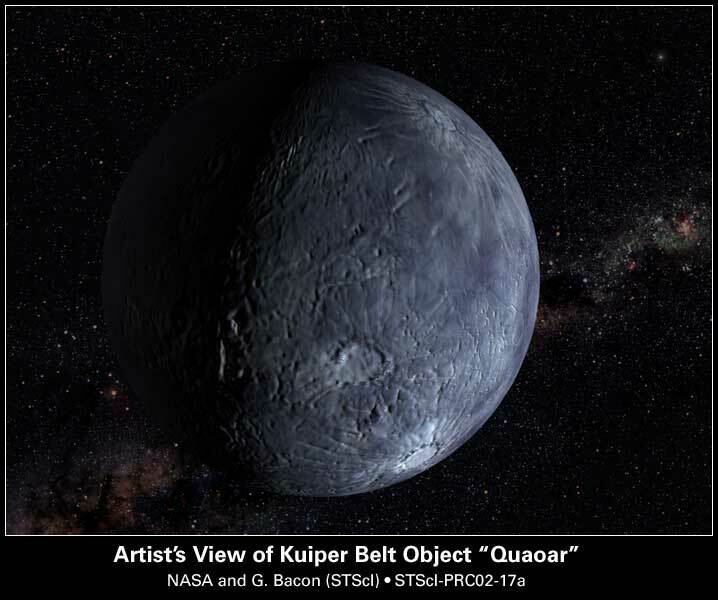 On February 17, 2004, a team of astronomers (Chad Trujillo, Mike Brown, and David Rabinowitz, who include discoverers of Quaoar) announced the discovery of an Edgeworth-Kuiper Object (EKO) that is similar to Quaoar in size, which was given the provisional designation of 2004 DW. Based on its current distance of around 48 AUs from Sol, brightness, and presumed albedo or ability to reflect light of nine percent, 2004 DW was initially estimated to have a larger diameter than Quaoar at around 990 miles (1,600 kilometers), but an August 2006 table posted by Mike Brown (a member of the discovery team) now lists a diameter of around 680 miles (1,100 kilometers), or just under half the size of Pluto. In a 2008 paper, astronomers using the infrared Spitzer Space Telescope made new estimates of a diameter of around 946 +/-70 km (587 miles) and an albedo of 19.3 percent (Stansbery, Grundy, and Brown, 2008). 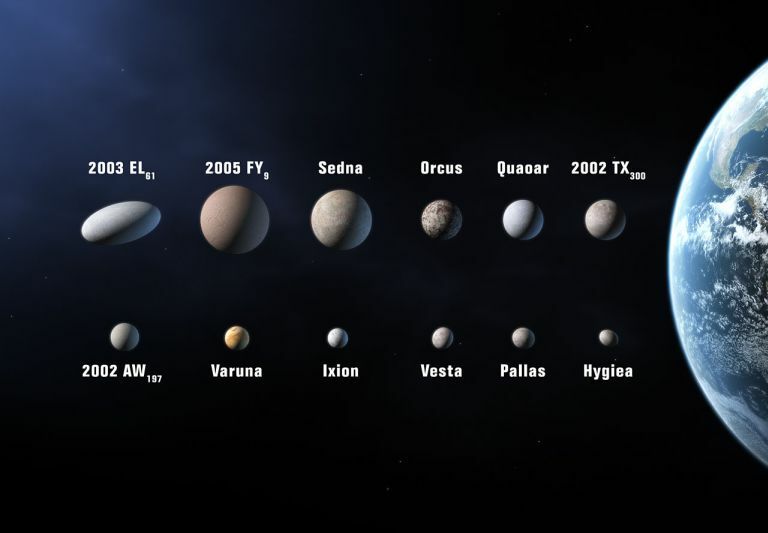 On August 24, 2006, the International Astronomical Union (IAU) voted to establish a new category of Solar System objects called "dwarf planets." 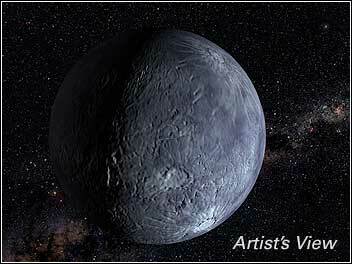 Orcus (2004 DW) is large enough to have a spherical shape and so is a candidate for IAU designation as a dwarf planet. 2004 DW has an orbit similar to Pluto's. Hence, it has been classified as "Plutino" -- an EKO in an orbit that goes around the Sun twice for every three times that Neptune orbits around the Sun. As a result, the IAU approved the permanent name "Orcus" for this object, which comes a Roman god of the dead and is another name for the Greek deity of the dead Hades. Based on preliminary orbital characteristics determined using images of the object traced back to a First Palomar Sky Survey photograph of November 23, 1954 and to a November 8, 1951 photograph by Australia's Siding Spring Observatory, Orcus' orbital distance from the Sol varies between 30.9 and 48.1 AUs with an orbital inclination of about 20.6�, which is larger even than the orbital inclination of Pluto. It takes 248 years to complete its orbit. 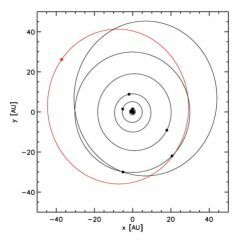 Having reached its farthest point from the Sun in 1989, Orcus is now moving inbound towards Sol, reaching perihelion in 2113 (more details, an orbital illustration, and an animated image are available from astronomer Chad Trujillo). The Orcus discovery team has pointed out that the object's elongated orbit points in a nearly opposite direction from Pluto with precisely the same orbital period and both always keep to opposite phases of their orbits, as if Orcus was an "anti-Pluto" (more discussion from astronomer Mike Brown and from Astronomy Picture of the Day). In 2008, astronomers announced that spectroscopic observations of Orcus indicate that the planetary body has "crystalline water ice [rather than amorphous ice due to irradiation within 10 million years] and possibly ammonia ice" (which also easily destroyed by energetic radiation from the Sun) on its surface. As these ices do not persist over time, they must be renewed, probably through some geological activity. 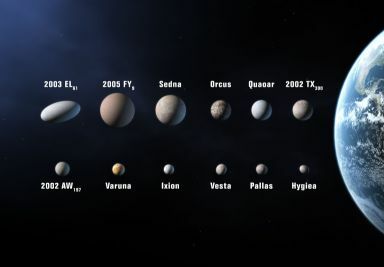 On June 11, 2008, the International Astronomical Union (IAU) voted at the meeting of its Executive Committee to establish bright "dwarf planets beyond the orbit of Neptune as a new class of substellar objects in the Solar System called "plutoids" (IAU press release). According to the IAU, these plutoids "are celestial bodies in orbit around the Sun at a distance greater than that of Neptune that have sufficient mass for their self-gravity to overcome rigid body forces so that they assume a hydrostatic equilibrium (near-spherical) shape, and that have not cleared the neighbourhood around their orbit. Satellites of plutoids are not plutoids themselves, even if they are massive enough that their shape is dictated by self-gravity. The two known and named plutoids are Pluto and Eris [formerly 2003 UB313]." In addition, "it was decided that, for naming purposes, any Solar System body having (a) a semimajor axis greater than that of Neptune, and (b) an absolute magnitude brighter than H = +1 (magnitude will, for the purpose of naming, be considered to be a plutoid," so that many large and relatively round Edgeworth-Kuiper ice bodies may eventually be designated as plutoids, including Orcus. According to astronomer Mike Brown's blog entry for December 31, 2007, Orcus has a tiny moon, that was discovered using the Hubble Space Telescope (Brown and Suer, 2007). Assuming that Orcus' moon Vanth (more below) has a similar albedo, the satellite may be comparatively large like Pluto's Charon, at around 220 km (136 miles) in diameter (Barucci et al, 2008). Named after Vanth (the Etruscan goddess of the Underworld), it has an orbit around Orcus of approximately 10 days, that appears to be in "a tight and precise circle," according to a March 23, 2009 blog entry. Orcus and its moon may also be in tidal lock with the same sides facing each other, like Pluto and Charon. Although Pluto and Charon may have been formed from a giant collision and much smaller Edgeworth-Kuiper Belt objects are believed to have acquired moons by simple gravitational capture, it is unclear how mid-sized Orcus obtained its moon. Orcus may be a good example of a large planetary body with a lot of ice that did not have a giant collision like Quaoar. Orcus (which is about the same size as Quaoar or around half the size of Pluto) has a moon like Quaoar. 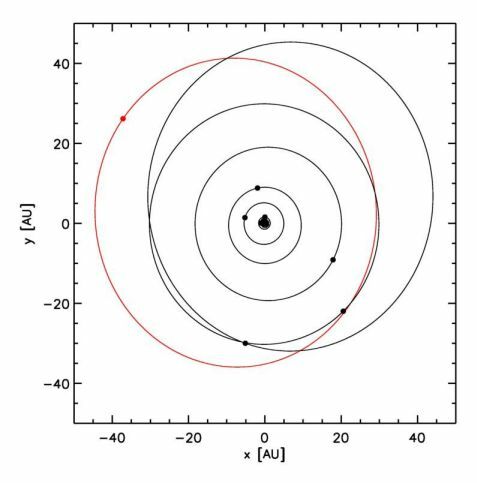 Observations with the Hubble Space Telescope in late 2006 have been used to track the orbit of Orcus' satellite and to determine that Orcus is much icier than anticipated. While this moon could have been formed in a giant collision, the satellite is somewhat larger than the recently discovered moons of other large planetary bodies beyond Neptune's orbit, which look like collisional remnants. Hence, it is more probable that Orcus never experienced a giant impact and that its moon is simply another planetary body captured from Solar space. Brown hopes to better determine whether Orcus' moon was created from a collision or captured from space by looking more closely at the composition of its surface to see whether it is very different in surface composition from collisionally formed satellites, by analyzing the spectrum of sunlight after it has reflected off the surface of the satellite with the Keck telescope at the end of March 2008 (more). Astronomer Chad Trujillo's discovery team maintains an Orcus (2004 DW) FAQ page. © 2004-2010 Sol Company. All Rights Reserved.